Cocoa Hernando make gourmet chocolate bars inspired by their globetrotting travels. The latest flavour in the range is Syria, a rose dark chocolate. I’m a rose fiend so when I heard about this new bar I had to try it. The tale behind this bar is a visit to Damascus where a confectionery stall holder was handing out rose petal sweets and shared tales of the mystical whirling dervishes. And so we have a rose flavoured bar with a beautiful illustration of whirling dervishes on the packaging. The rose in the Syria chocolate bar comes from rose otto oil and is balanced in the dark chocolate so it isn’t overly perfumed or cloying. Delicious. 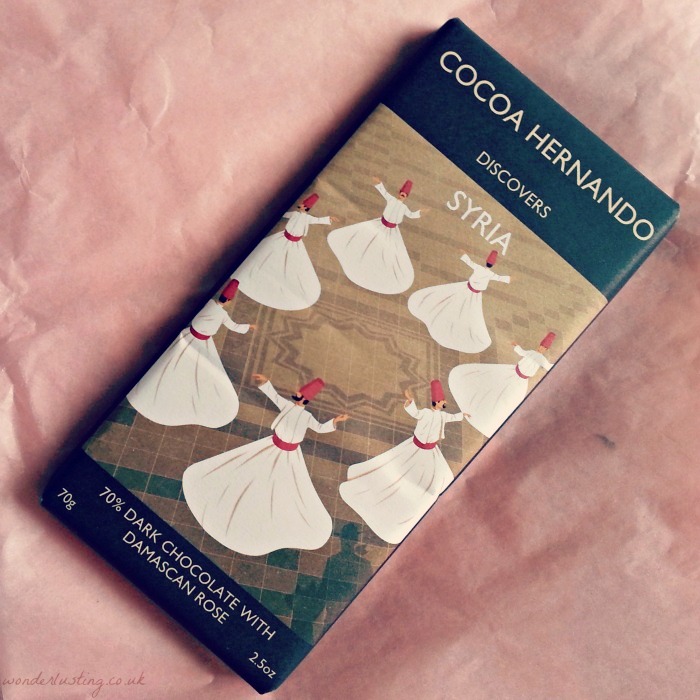 Cocoa Hernando Syria 70% Dark Chocolate with Damascan Rose ingredients: cocoa mass, sugar, cocoa butter, rose otto oil, emulsifier: soya lecithin, natural vanilla flavouring.